The origin of the unusual name Santomè is of considerable historical interest. In 1999, having purchased the 30 hectares in Roncade and decided to turn the site into a winery, all that was left for the Spinazzè family to do was to choose a name. Well, as is often the case with newborns, we have to look to the origins, the predecessors, about which there is a rather strange anecdote. 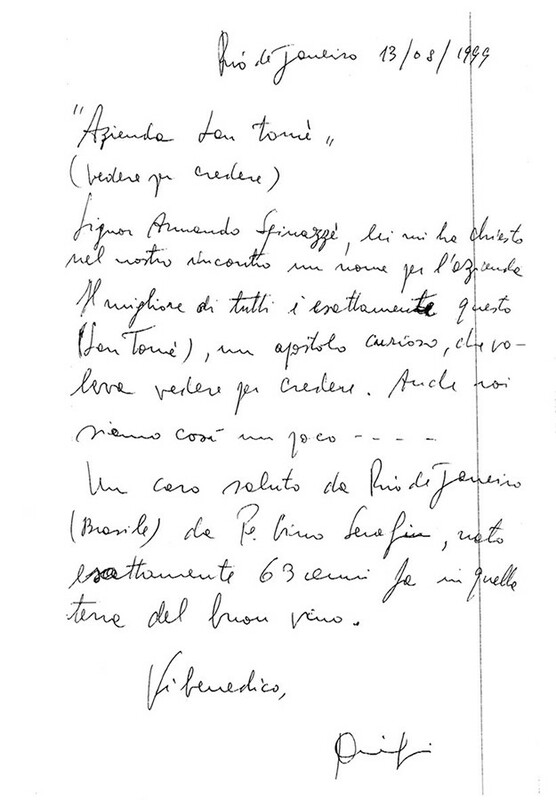 Having consulted the previous owners, a telegram arrived from Brazil on 13 August, 1999, from someone who had spent his childhood in the very place where the B&B is now located: “The farm was called Santomè [short for San Tommaso, or “Saint Thomas” in English], an apostle who was so curious that he always wanted to see before believing”, signed “Father Gino Serafin, born exactly 63 years ago in that land of good wine”. Pitch-perfect in its styling and colours, the logo – something of a seal of quality – is the element that most effectively highlights and sets the tone for the label. 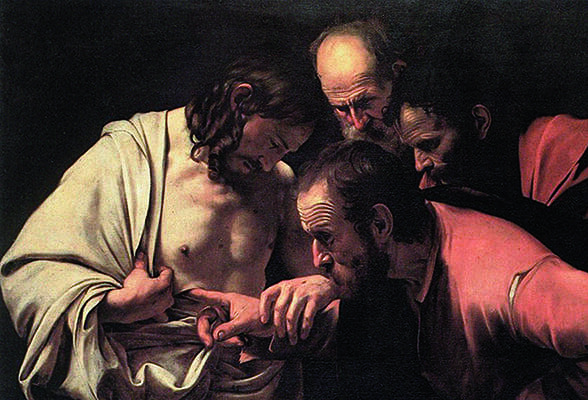 It depicts the apostle Saint Thomas (Santomè). That saint – with his fingers at a right angle, as if they were a tool for measuring and checking just about anything – perfectly embodies the spirit of our modern entrepreneurs; a spirit that makes the most both of the innovations so typical of the creativity of north-eastern Italy, and of the genuine quality of a product that has its roots in the most down-to-earth of rural cultures. 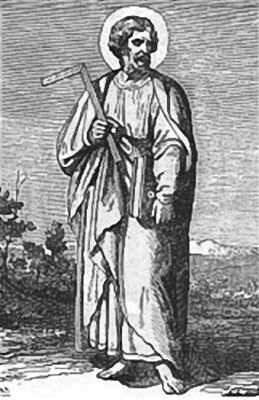 In the art of the Middle Ages and the early 18th century, Saint Thomas is often portrayed holding a set square – an architect’s instrument – since he had to construct a building for King Gondophares, in India, as recounted by a number of apocryphal gospels. Saint Thomas is also depicted in this way on the eastern door of Bamberg Cathedral (1230) in Bavaria (Germany). He is, indeed, the patron saint of architects and engineers. It is also significant that the image reproduced in the logo contains a dual right angle: in the shape made by the fingers and in the shape of the nose. “I am like Saint Thomas: I don’t believe it unless I’ve sniffed it out” (popular saying). When our customers touch our products, they can verify their quality and the seriousness and care with which they have been made. We wanted to encapsulate in 3 simple words who we are and what we are all about, and this tag line expresses clearly and immediately the concept of a family whose members love the work they do and who, driven by passion, try to represent the part of the world in which they live. Since 1971, Father Gino Serafin has been working on the Treviso Village project in Rio de Janeiro, which is geared towards looking after children and young people in the favelas, giving them one square meal a day and helping them to access public school by assisting them in their efforts to achieve basic literacy. The “Treviso Village” project is a charitable initiative that has been ongoing for almost 20 years and is aimed towards preventing the phenomenon of the meninos de rua, the street kids of Rio de Janeiro. It is a project that has gradually developed over the years – first and foremost thanks to its prime motor Father Gino Serafin, a missionary in Brazil, but also to the contribution of the many volunteers who have put their weight behind the project. The Treviso Village Charitable Trust supports the Vila Paciencia primary school, which caters to the educational needs not just of very young children but also of other age groups. The facility is a full-time reception centre for early years learning and also offers after-school services for primary and middle school children, as well as professional training courses (information technology technician, electrician, tailor, beautician, baker) for older people. The purpose is to give youngsters a proper chance to become functioning members of the society in which they are born and raised. A.Vi.T. – Associazione Villaggio Treviso (the Treviso Village Association) is proud to have supported thousands of children and families over the years.